Tison gives a lesson to the staff cooks at Northwell's Lenox Hill Hospital on Manhattan's Upper East Side. The hospital offers a white-tablecoth bistro-dining option. It's not news that hospitals have been working for a while to improve their culinary game. But Northwell Health has kicked things up a notch. As corporate chef and assistant vice president of system food services at the New Hyde Park, N.Y.-based system, Tison oversees all food preparation at Northwell's 23 hospitals. "I always think of cooking for someone as the greatest act of care and love," he told Crain's New York Business. "I decided at this point in my career that I wanted to cook for people who are sick." Once food wasn't exactly Northwell's strong suit. 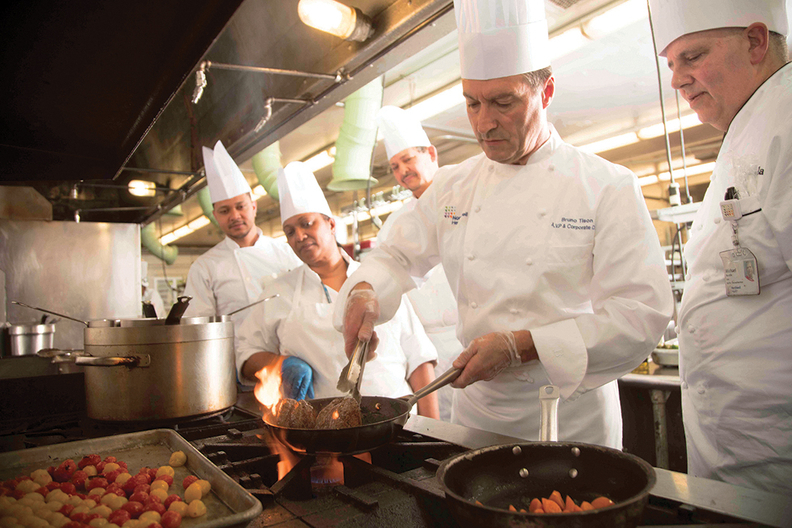 Many past patients rated its meals as "not good, or awful," said Sven Gierlinger, Northwell's chief experience officer. Gierlinger, himself a trained chef, hired Tison to turn things around. "Food has been treated as a liability … but we're changing it into an asset," he said. Tison said his new job is satisfying. "I think of all the celebrities I cooked for; I never got a thank you. Now when I walk through a hospital room, I see a patient with joy on their face, and they want to thank you for passing by. It's very, very rewarding." This story was edited from Crain's New York's original story, "Look who's cooking at Chez Northwell."